Earth made the full trip around the sun. 365 revolutions of the earth. And we are supposed to “make new decisions” about the time it will take for the earth’s next full trip around? What was wrong with our old decisions? Didn’t yours all happen the way you decided? I know mine sure didn’t. Not even close. The sudden changes in the market stood many predictions on their heads. An awful 1st quarter, a decent 2nd quarter and a mediocre 3rd and 4th quarter for us – we wound up 2013 closing 342 transactions. But congratulations are not in order – as that is down from our 435 closed transactions for 2012. Oddly enough, our annual sales volume ($63,973,603.) didn’t suffer, in fact it was up by almost a million dollars – due to prices being higher than in 2012. We hope it is happy. Happy = It went like we wanted and planned. For the record I am planning on doubling the amount of business in 2014 we did in 2013. I am no longer trying to figure out HOW to generate buyer sides, thanks to finally having that crazy making issue resolved thanks to my Real Estate Webmasters site (www.allphoenixareahomes.com). So we have added 2 buyer agents (for a total of 6) and hitting 200 closed buyer deals in 2014 is no longer a pipe dream. That now solved – along with the market shift back to “traditional sellers”, we can once again make lead generation for sellers our primary focus and have our (considerable) marketing dollars have a huge impact (regardless of the now numerous local copycats). The new radio ad is done. The new TV ad will be done early this month. Our staff is fully groomed to provide an even higher quality level of service so the experience our clients have will create more raving fans. Some of you felt battered in 2013. I did too. It is just part of the deal. If you don’t ever want to get hit, don’t get in the ring. This is going to be a GREAT year. Won’t you join me? Yes. When the market slows, as it has, it does not mean that “nothing is selling” or that it has all gone to hell. Buyer activity (which is what drives the market) is never really constant. It is always fluctuating – and therefore the relationship between supply and demand is seldom static – it is normally moving. It is that relationship between supply and demand that tells you which way prices are moving. Trying to determine the actual rate of increase or decrease WHILE it is occurring is difficult. After the fact, it is an easy calculation. You can see examples of this by observing how major banks behave in pricing their REO properties. 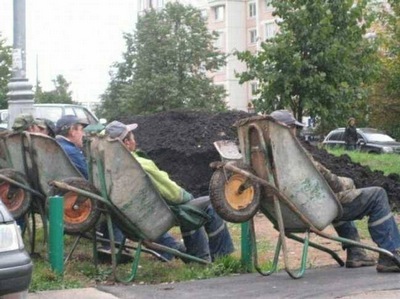 They tend to be out of sync with the market. 3 or 4 years ago, they were under pricing everything in our area and the buyers would bid them up to the “actual market price”. Recently, they have been overpricing lots of inventory. Part of their problem is how removed they are from the scene and they usually rely on asinine economist’s data or the kind of crap companies like Core Logic churn out. It is just simply wrong. No agent ever needs to make that error. Here is what is true. Any house is “worth” what a willing buyer will pay for it and a willing seller will accept. Now. The is the point that is typically missed. Now. How much will they pay for it, NOW. Not what did the agent think it was worth last month. Or how much it might “appraise for” next year. Now. 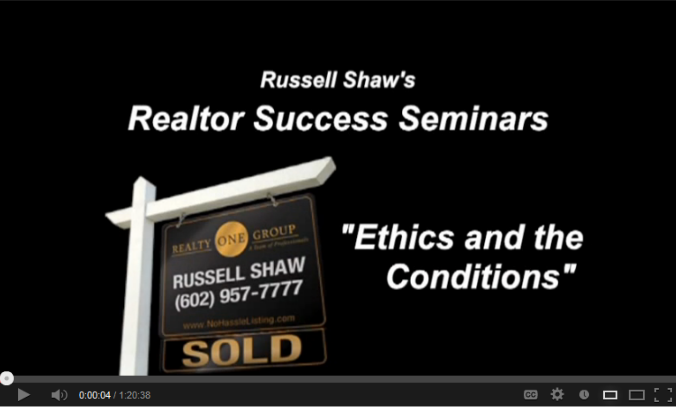 Here is a video link for a seminar I gave to agents. It is just under 90 minutes long. It is a remarkable tool for predicting the behavior of others. I think you will really like it. When I finally discovered in late January what Zillow had done to me and all of their paying customers outraged me so thoroughly that I called and made several demands. Working my way through their channels it became obvious that they had no intention of doing any of them. From their point of view they had done precisely nothing wrong. They had sent a notice. It was all legal. In other words, they could get away with it. The 2nd person I spoke with is named, Martin. Martin’s job was to handle people who wanted to cancel their account with Zillow. I told Martin that I was aware of the continuous price increases but that what they did in October was a covert and underhanded move designed to hide a massive price increase and that they had actually cheated me and all of their other customers when they did it. It was about the same as a Realtor filling out a listing form, charging the seller 6% and then going back in to an elderly person and having them unknowingly agree to a 15% commission. Martin didn’t see it that way at all. But that is exactly how I saw it. I am accustomed to advertising vendors attempting to overcharge me. I spend a little over $800,000 a year on marketing. Every year at contract negotiation time pretty much every TV and radio station wants to explain why we should pay more for even less. It wasn’t the fact of a price increase that outraged me – but the disingenuous method they chose to use. And no TV or radio station (or other source of internet leads I’ve ever used) has ever attempted to trick me once I made a deal with them. According to Martin, Zillow had simply “changed their business model”. I explained to him that based on what each lead cost me the cost per closed deal (buying Zillow leads) went from about $1,100 a deal to about $1,900 a deal. He became agitated that I kept insisting on using a cost per lead – he let me know “we don’t sell leads, we sell number of impressions”. Really, Martin? Cost per impression? Fine, if you hadn’t at the very same time tried to hide the fact that you REALLY jacked the price this time. So high that I believe any agent who sees and understands what your company just pulled and can see what their true cost is now will simply stop doing business with Zillow. Refund to me the money they had overcharged me. Refund to all of the other agents they had overcharged. Issue a public apology for having been sneaky about it. Promise to never do it again. Martin made it clear Zillow wasn’t going to do any of these things. They didn’t have to refund me or anybody else. They had “sent a notice” they were making those changes. It was legal. 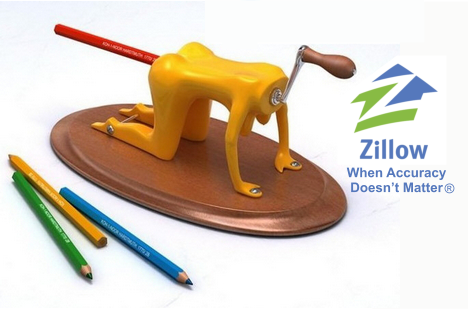 Can Anybody Trust Anything Zillow Says? www.zillowsucks.com was already taken. Same for www.zillowsucks.net. Already taken. This is a company that is openly mocked and pretty much the entire agent community (their actual paying customers) dislikes them. The people who might speak up in their defense are on their payroll. They spew FALSE AND MISLEADING DATA almost non-stop and pretend like it is factual information. This false information is not limited to their usually silly “Zestimates”. Oh no. In the months and years ahead I will document that the initially open (but now hidden) CONTEMPT that Zillow’s founder has for agents remains an interegal part of the make up of the company now. I will take up the ACTUAL PURPOSE of Zillow and demonstrate why the PRICES THEY CHARGE WON’T WORK for their paying customers. I will show, with specifics, that they are PASSIVE-AGRESSIVE in most of what they do and say. Every word or phrase that is capitalized in this post will be the subject of a future post. And …. I promise to make each and everyone of them informative and entertaining. 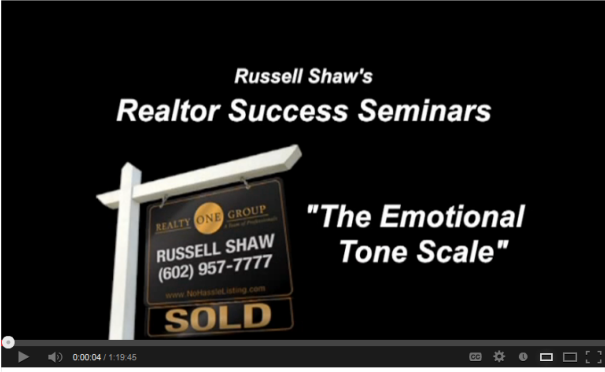 If you are a working Realtor and want to “give yourself a raise” this short post is for you. There are many many “things which must be done” in your business. Many. To skip just one of those things is to invite eventual disaster. But that does not mean YOU have to physically do each of them yourself. In fact, doing them all yourself is a very expensive way to foolishly spend money. There are DOLLAR PRODUCTIVE ACTIVITIES. And then there is everything else. There are only two types of activities which can not ever be delegated. Just two. Lead generation (not lead conversion, it can) and quality control. All other actions can be delegated. All of them. You will always make the greatest income if YOU focus on Led Generation and delegate the rest. The first thing to get rid of is the $15 an hour stuff. Your time spent on lead gen is worth at least $200 an hour. You doing $15 an hour work costs you $185 an hour for you to do it. And get over the (false) idea that customers only want you. They want a certain result. Not “you”. This is done on a gradient. First get rid of $15 an hour work. And get a life in the process too. Over the years I’ve had agents tell me they "wanted a big team". Or they "didn’t want a big team". I’ve never seen anyone who didn’t want "a big team" have a need for a team at all. And (other than an oversized self image) I’ve never seen any good reason to "want a big team". It just doesn’t work that way. Further, most "real estate teams" are not "teams" at all but simply people who sit at offices in the same building or room. They are not teams in any real sense of the word, "team". I believe the fundamentals of team building are the building blocks of building a business. Here is a link to a page that has pretty much the entire two hour talk I gave (Wendy came in near the end and covered hiring) and also some links to little snippets where specific questions are answered. Thanks to Phil Sexton for doing all the editing and making this possible. I hope you like it and find it as helpful as I intended. Oh sure. Lots of agents will complain and bemoan having to pay more. But I doubt NAR will lose any members (due to the dues increase) they weren’t going to lose anyway. 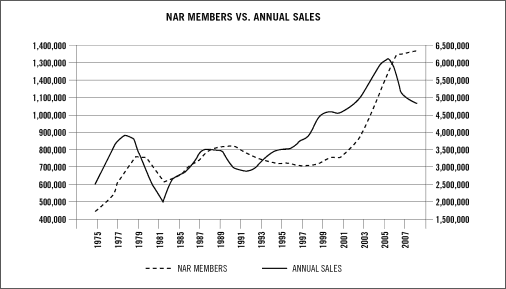 There is a very interesting relationship between how many members NAR has and the average number of sales per member. Although some members are not directly or significantly impacted by this sales-to-member-ratio, it does have an impact on the average NAR member, regardless of if they think it does or not. The chart above, showing NAR Members VS Average Sales is from the wonderful Gary Keller book, Shift. Looking at the chart it is pretty easy to see a pattern: that there is a relationship between the number of members and the number of sales. And that the number of members – when falling off – lags the drop off in the market. 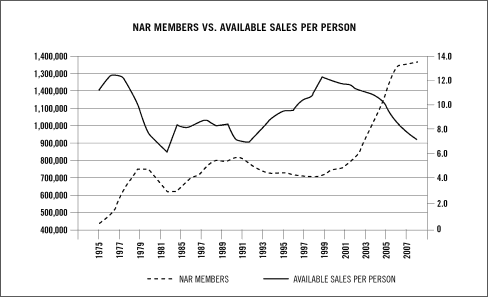 Notice in this second chart, NAR Members VS Available Sales Per Person that because of that lag (NAR membership is at its lowest when the perception is “the market is bad” and highest when the perception is “the market is good”) there are times when the Number of Available Sales Per Person is much better for the members in the business. Right now is one of those times. In my area, Phoenix, the market is on fire – with some months being record breaking months (December and February, for example). Prices are at the very bottom – that is what is driving the buying frenzy – but the local media, quoting always behind the times local economists, are still pushing the “doom and gloom, things are awful” line. So both agents and the public tend to believe things are awful – when just the opposite is true. 1. NAR does a lot of things wrong. 2. They do a lot of things right. 3. They do a lot of things that don’t matter much. An annual dues increase of $40 would be in that last category – as far as membership retention goes. How they spend that money and how effective that winds up being with regard to accomplishing the intended objectives will determine if the results are in category 1 or 2. You are currently browsing the Number 1 Home Agent blog archives.